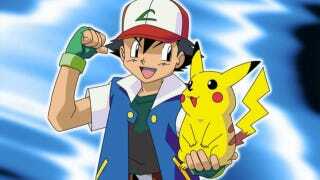 This is Pikachu, and his trainer, Ash (or "Satoshi" as he's called in Japan). This is how they've looked in the Pokémon anime. Nothing really strange here at all. Ash and Pikachu, hanging out. Got it. This image has gone viral in Japan, where it's been re-tweeted over thirty thousand times in just two days. Pikachu with Ash's eyes isn't so bad (it's actually a thing, after all), but Ash with Pikachu's eyes is nightmare fuel.